In my mind I’m saying “Finally!” but in reality, it was less than a week that I started this project. It’s not the perfect fit as you can tell by the creases at the underarms — forward shoulder adjustment needed, but I love it nonetheless, it fits everywhere else. I love the length, the bib and especially the pleated sleeves. I used white pearl-like buttons which mysteriously appear silver in the photo. 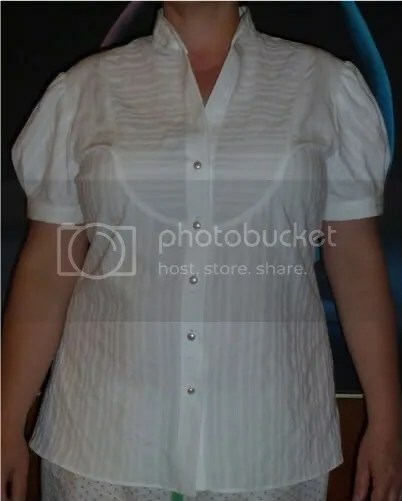 My biggest challenge with this shirt was the collar, I ripped it out and reattached it at least 5 times before I was happy with the placement. Since I need many more tops in my wardrobe and love mandarin collars, I’d better get a little better and quicker at attaching them. I also really like the length of this shirt, I can’t wait to wear it today! Next on my hit list is New Look 6407 which I’m going to make out of a light blue cotton as my muslin with a forward shoulder adjustment to finally get rid of those unsightly underarm creases. View E with the sleeves of View D with the ties. The plan is to then make it again with a cotton vole border print which most people use for skirts. I thought it would be very interesting to use the border in a top instead. 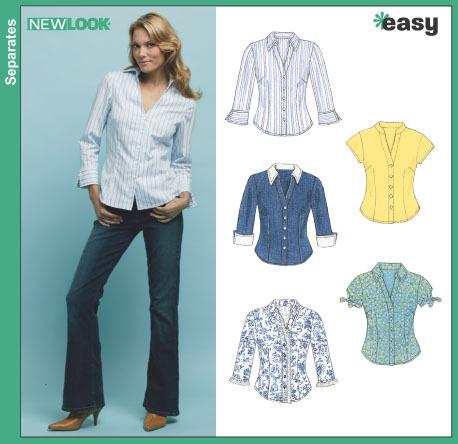 This entry was posted in Shirtmaking, Simplicity by Tabatha. Bookmark the permalink. Go for it Jennifer! If I’d had an entire 2 days to work on it, it would have been done much sooner.